Photon Systems Instruments Model FMT-150 / 400 White Photobioreactor 150.2 . New Life Scientific, Inc. The FMT 150 photobioreactor (version 150.2) and power supply are in good cosmetic condition. There are spots on the body of the bioreactor where rust has formed, but it does not hinder the mechanical integrity of the instrument. 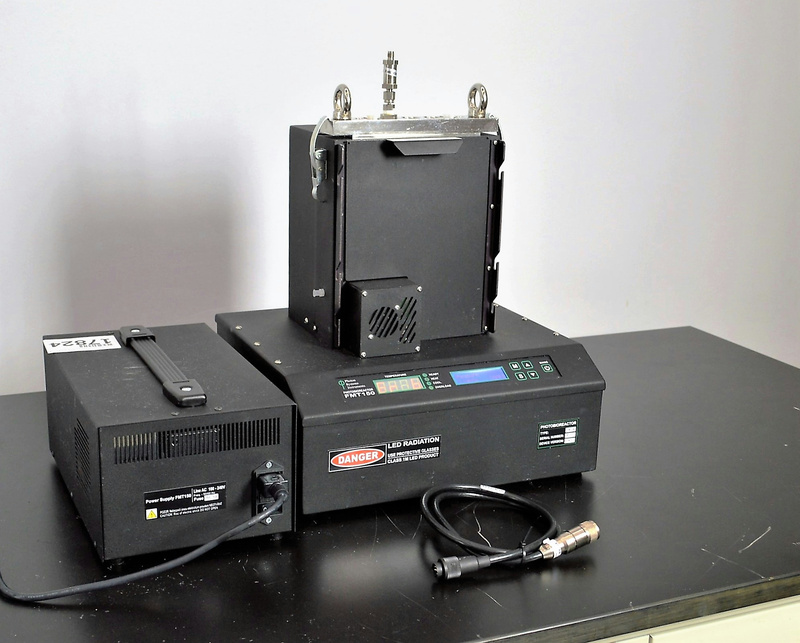 The functionality of the FMT 150 was tested by New Life Scientific technicians; the white LEDs were powered on and the temperature/pH cable was used. NLS used a non-sterile pH probe to test the bioreactor chamber with software; they have confirmed the instrument is functional. Unfortunately, there is no software included in this listing but the customer can contact Photon Systems Instruments for the netbook and software, or additional licenses. The technicians received a software quote which is available below, along with a link to the digital manual for supplemental reading. There are additional parts available from New Life Scientific in separate listings including: 400 mL cultivation vessels, white LED light panels & power supplies, and cables. Please note that the 'error 6' (displayed) indicates the instrument is not connected to a probe during photography. The instrument photographed may not be the exact one received; however, this FMT 150 is a representation of the condition and functionality for the quantity available in this listing. For more information, please contact New Life Scientific or see the embedded links.